The power of teaching students literacy skills is well documented in educational research. But what does that look like in districts, schools, and classrooms, and more importantly, how do you create a culture of literacy that is pervasive and long lasting? In my many years at Brockton High School, we transformed from a school ranked as one of the lowest performing in Massachusetts to a National Model School, recognized for academic excellence. We accomplished this by focusing relentlessly on literacy. Led by our leadership team, we implemented a Literacy Initiative across the curriculum that focused on teaching the students the skills they need in reading, writing, speaking, and reasoning, in every classroom. But that first required us to teach those literacy strategies to our faculty—in EVERY discipline. There was no magic formula, no silver bullet, no special program. Rather, our “secret sauce” was simple, but not easy. Our four steps to creating this powerful culture of literacy have become a template for many leadership teams to follow. Let’s look at each of those steps toward creating a culture of literacy. Our leadership team, which included faculty and administration, examined the data and we asked ourselves what skills our students need to be successful on our state assessment, in their classes, and in their lives beyond school. From that discussion, we determined that our students needed to read challenging selections (particularly nonfiction), write clearly, speak professionally, and think critically. That led us to literacy. Our leadership team defined literacy in four domains: reading, writing, speaking, and reasoning (see an outline of the Literacy Initiative, below). Within each domain, we detailed very specific literacy objectives that teachers would teach to their students—every teacher, in every discipline. But first, we had to teach these skills to ourselves. Many educators may feel as I did when I was teaching history. I was not opposed to teaching reading or writing, but frankly, I didn’t have the strategies. When I would present my students with difficult primary source readings, they often said, “Miss, I don’t get it.” Then I’d utilize the only reading strategies I had in my toolbox telling them, “Read it again.” And if they still weren’t getting it, I’d go to a deeper level, “Read it more slowly.” Hardly effective literacy strategies. Our challenge was adult learning. 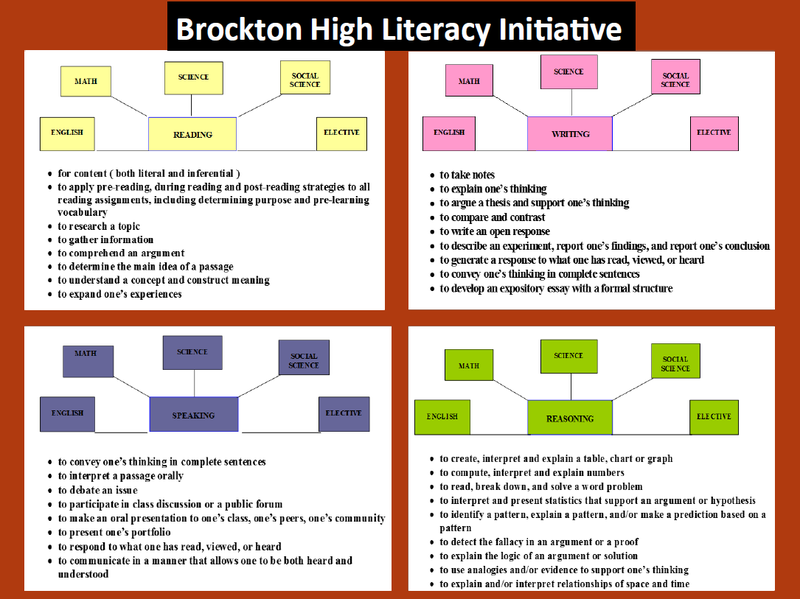 We needed to ensure that all of our teachers had literacy strategies in their toolboxes. Once the literacy objectives in reading, writing, speaking, and reasoning were established, teachers received training in how to teach and integrate those skills in their classes. Faculty meetings became literacy workshops, created and led by our leadership team. This was teachers teaching teachers. We modeled for the faculty the writing process that they would teach to the students—highly effective professional development. All teachers were taught how to teach active reading strategies and a writing process that would be implemented across the curriculum. A calendar was established to ensure that students were given repeated practice in these critical literacy skills. This became our greatest challenge—how to ensure that this practice was happening with fidelity and rigor across the school. We monitored the faculty implementation by direct observation of the literacy instruction, and by utilizing a common rubric. We followed up by having teachers review, compare and discuss student work. By grouping teachers in common grades and subjects to review students’ writing, we began to increase the consistency of rigor for all of our students. Creating a culture of literacy works! Literacy is not a trend, it will not get outdated, it can be replicated, and it does not cost a fortune. Most importantly, creating a culture of literacy provides our students with the skills they need to be successful not only in school, but in their lives beyond school. Simple, not easy. Dr. Sue Szachowicz retired as principal of Brockton High School and now is a Senior Fellow for the Successful Practices Network. She chronicled the turn-around of Brockton High in her book Transforming Brockton High: High Standards, High Expectations, No Excuses. She will be speaking at the Principals of Literacy Institute (Nashville, TN / September 20 – 22, 2018), brought to you by Scholastic and NAESP.